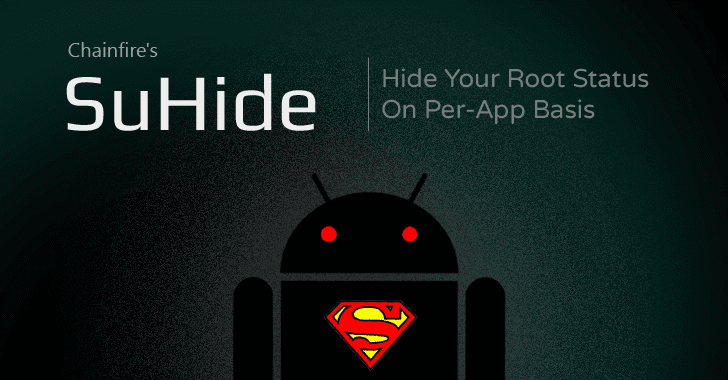 Famous Android developer Chainfire released an experimental hack with a new app, called "Suhide," that allows users to hide the root status of their rooted Android devices on an app-by-app basis. Rooting your Android device can bring a lot of benefits by giving you access to a wide variety of apps and deeper access to the Android system...But at what cost? One of the major drawbacks of rooting your device is losing access to certain apps, which includes banking, payment and corporate security apps that work with financial and confidential data, such as your bank details. Such apps don't work on rooted devices. A great example for this is Google's Android Pay. Since its launch, developers has been working hard to get Android Pay working for rooted devices, but unfortunately, they have not gotten much success. But Why Rooted Devices? It's because Google cares about your security. Google uses something called SafetyNet API to detect whether your Android device is rooted, and restricts access to those features. If, say, your Android device got infected by some system-level malware that has the ability to spy on Android Pay and other apps, SafetyNet would prevent Android Pay from functioning. The SafetyNet API works by checking whether an Android device has been tampered with – either it has been rooted by a user, is running a custom ROM, or infected with malware – and if found any tampering, the API blocks access to that app. Google has also made the SafetyNet API available to all third-party app developers to check for the presence of root. However, the Suhide app, developed and released by Chainfire, allows users to hide the root status of their device on an app-by-app basis, and it seems to be working with Android Pay as well. The app also works with several other applications that currently require a non-rooted device for running. Suhide works only on a stock ROM (to beat Google's SafetyNet) based on Android 6.0 Marshmallow or higher. However, the app probably will not last longer, as Chainfire came up with Systemless Root late last year, which did not allow Android Pay to detect rooted users, but after a little while Google patched things up, rejecting rooted users once again. So, the chances are that Google will undoubtedly catch up with Suhide and other potential hacks that allow users of rooted devices to hide the fact that they are rooted. But for now, you can enjoy using Android Pay on your rooted device once again until Google comes up with a new update.